Apple's new premium, professional grade all-in-one desktop, the iMac Pro, is now shipping to customers, though deliveries from China are not expected to arrive before Christmas. Early iMac Pro adopters were informed Thursday morning that their new system is now on its way. 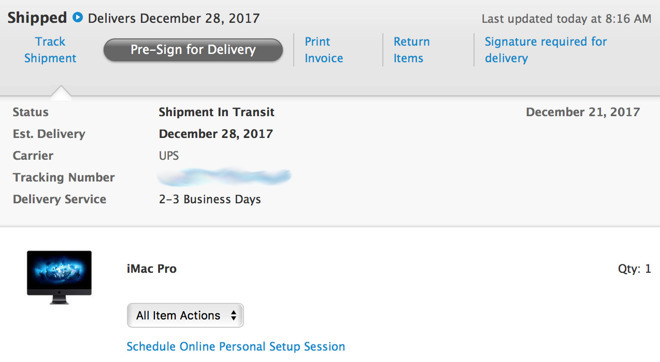 Orders seen by AppleInsider are estimated to arrive on Dec. 28 via UPS. Currently, the $4,999-and-up systems are in Shanghai, where they are awaiting "final release" from a clearing agency. Reports have suggested that some iMac Pro units could show up in Apple's own retail stores this week. However, no inventory was listed available at the company's biggest stores as of Thursday. The new 27-inch iMac Pro with Retina 5K display is intended for high-end demands, featuring a base configuration with an 8-core processor running at 3.2 gigahertz, 32 gigabytes of ECC DDR4 2666 RAM, a Vega 56 GPU with 8 gigabytes of VRAM, and a terabyte of flash storage. More powerful configurations, including an 18-core CPU model, ship in 2018. AppleInsider partners Adorama and B&H, both Apple authorized resellers, are currently taking pre-orders for the iMac Pro with no sales tax charged on purchases shipped outside New York and New Jersey, potentially saving customers between $400 and $1,055. A full list of deals can be found in our iMac Pro Price Guide.